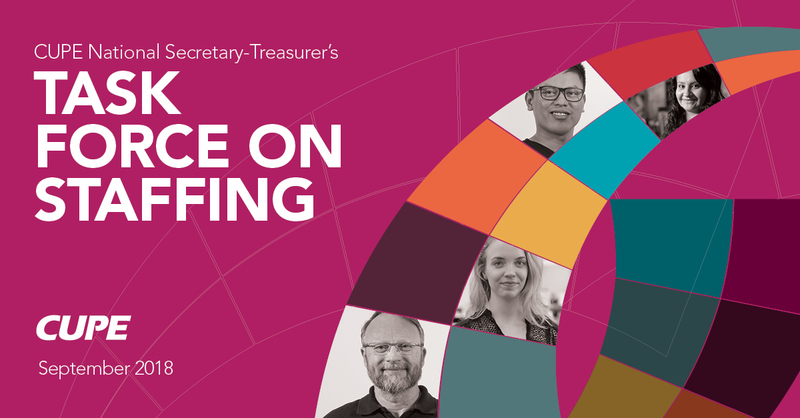 As outlined in the National Secretary-Treasurer’s Report adopted at the 2017 National Convention, a project was undertaken to: i) update and review the process used to determine staffing allocations; and, ii) identify servicing challenges facing CUPE National to ensure that locals, chartered bodies and staff have the best available support and resources. The National Secretary-Treasurer’s Task Force on Staffing comprised of members of the National Executive Board and senior staff took on this challenge. The Task Force began meeting in the spring of 2018 to investigate the new realities facing our locals and chartered bodies and to look at how CUPE can address new bargaining structures and respond to the needs of our locals and their leaders. It also compared current and historical data on staffing allocations and looked at the qualitative aspects of staffing, including evolving roles and expectations.